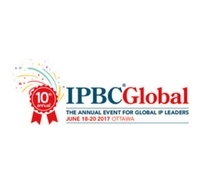 IPBC Global celebrated its 10th anniversary at the Shaw Centre in Ottawa. For the first time at IPBC Global, a range of exciting and fresh session formats – including Internet of Things and patent sales boot camps– were introduced as well as the unrivalled three days of networking opportunities that IPBC Global always offers. The event was considered a huge success by organisers and delegates alike and Judy Lane ICS are proud to have been charged with the organization of this fantastic event.